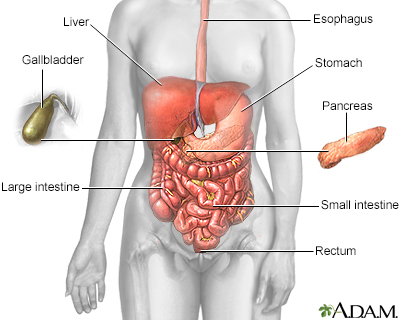 The pancreas is an organ located behind the stomach. It produces the hormones insulin and glucagon. It also produces chemicals called enzymes needed to digest food. Most of the time, the enzymes are only active after they reach the small intestine. If these enzymes become active inside the pancreas, they can digest the tissue of the pancreas. This causes swelling, bleeding, and damage to the organ and its blood vessels. This problem is called acute pancreatitis. Acute pancreatitis affects men more often than women. Certain diseases, surgeries, and habits make you more likely to develop this condition. Alcohol use is responsible for up to 70% of cases in the United States. About 5 to 8 drinks per day for 5 or more years can damage the pancreas. Gallstones are the next most common cause. 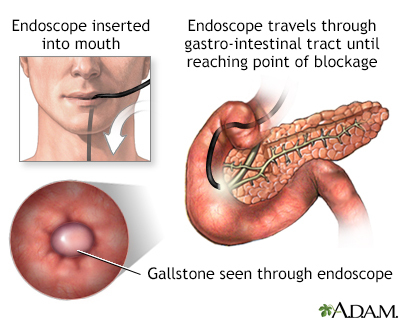 When the gallstones travel out of the gallbladder into the bile ducts, they block the opening that drains bile and enzymes. 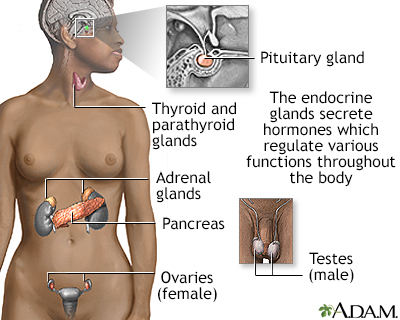 The bile and enzymes "back up" into the pancreas and cause swelling. Genetics may be a factor in some cases. Sometimes, the cause is not known. People with acute pancreatitis often look ill and have a fever, nausea, vomiting, and sweating. A tube may be inserted through the nose or mouth to remove the contents of the stomach. This may be done if vomiting and severe pain do not improve. The tube will stay in for 1 to 2 days to 1 to 2 weeks. Treating the condition that caused the problem can prevent repeated attacks. 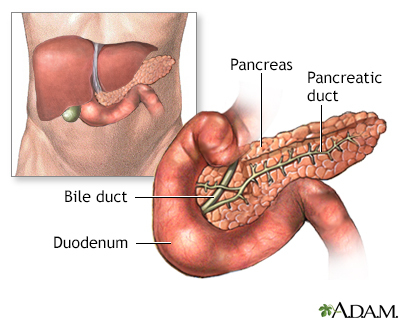 In the most severe cases, surgery is needed to remove damaged, dead or infected pancreatic tissue. Avoid smoking, alcoholic drinks, and fatty foods after the attack has improved. Most cases go away in a week or less. However, some cases develop into a life-threatening illness. Bleeding in the pancreas has occurred. Liver, heart, or kidney problems are also present. An abscess forms the pancreas. 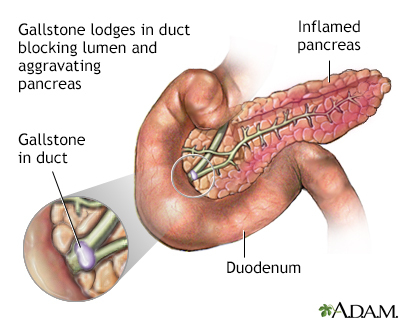 There is death or necrosis of larger amounts of tissue in the pancreas. Sometimes the swelling and infection do not fully heal. Repeat episodes of pancreatitis may also occur. Either of these can lead to long-term damage of the pancreas. You have intense, constant abdominal pain. You develop other symptoms of acute pancreatitis. DO NOT drink alcohol if it is the likely cause of the acute attack. Make sure children receive vaccines to protect them against mumps and other childhood illnesses. Treat medical problems that lead to high blood levels of triglycerides. Tenner S, Steinberg WM. 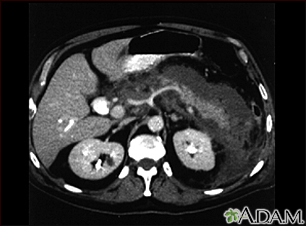 Acute pancreatitis. In: Feldman M, Friedman LS, Brandt LJ, eds. Sleisenger and Fordtran's Gastrointestinal and Liver Disease: Pathophysiology/Diagnosis/Management. 10th ed. Philadelphia, PA: Elsevier Saunders; 2016:chap 58. This upper abdominal CT scan shows inflammation and swelling of the pancreas caused by acute infection (pancreatitis).